I don’t do horror very much. Nothing against it. Just isn’t my thing. Still, the overlap with the world of comic books is rather obvious. So it makes sense that they’d land in this space. Hill has a tendency to photograph his figures with woodsy dioramas. When paired with the right lighting, it creates a deliciously ominous vibe. As always, my standard for great action figure photography is that, at least for a brief moment, it makes you forget you’re looking at a toy. All three of these images accomplish that. More of Jeremy Hale’s work can be found on ActionFigureFriday.com, as well as his Instagram. This entry was posted in Uncategorized and tagged Action Figure Friday, action figure photography, action figures, Freddy Krueger, Friday the 13th, horror, IT, IT (2017 film), Jason Voorhees, Jeremy Hale, Nightmare on Elm St., Pennywise the Clown, Rob Siebert, toy art, Toy Chest Theater, toy photography, toys on 12/06/2018 by primaryignition. This is what happens when you have writer’s block on your day off. You wind up trying your hand at toy photography. Whaddaya think? Not bad for a first-timer, right? To an extent, I’m trying to mimic the shot from The Empire Strikes Back where Luke is lost in the snowstorm and the camera pulls back. As the landscape expands, we see just how alone he truly is. This shot doesn’t have the same effect, obviously. But there’s a certain cuteness to it that I enjoy. 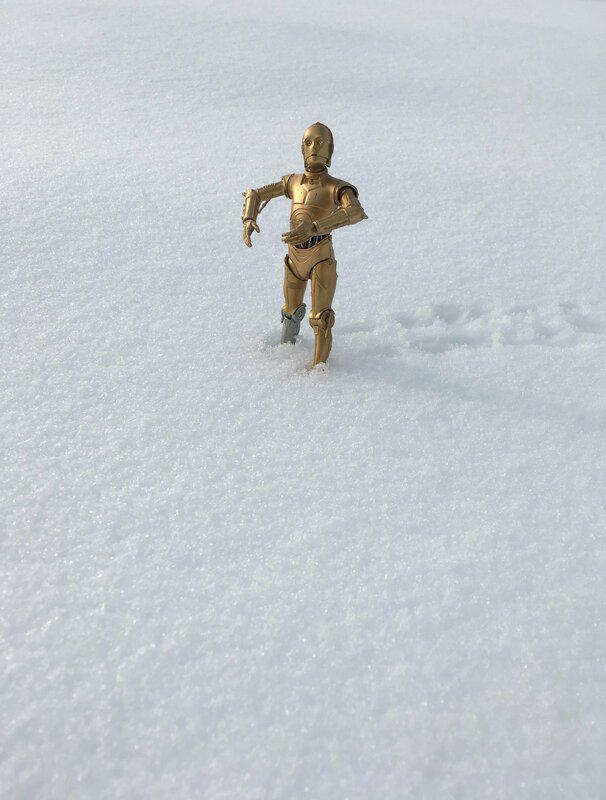 Oddly enough, I originally just plopped Threepio into the snow and took the shot. But of course, the best action figure photos are the ones that allow you to forget you’re looking at little plastic toys. So I made some little footprints next to him so he didn’t simply look like a toy someone left outside. Now he’s impacting his environment. It actually turned out to be my favorite part of the image. This entry was posted in Uncategorized and tagged action figure photography, action figures, C-3PO, Rob Siebert, Star Wars, Star Wars toys, Star Wars: Episode V - The Empire Strikes Back, Star Wars: The Black Series, The Empire Strikes Back, Threepio, toy art, toy photography, toys on 11/30/2018 by primaryignition. Once in awhile, we get a shot that’s pure magic. Indeed, if I had to sum up this piece in one word, it would be magic. 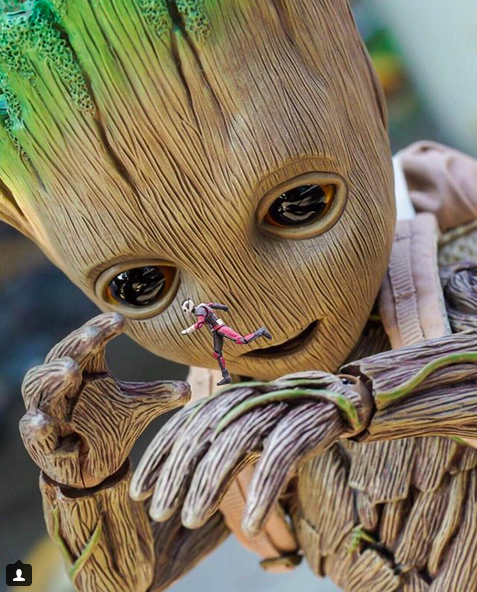 What pop_tastic_man creates here is a truly wondrous, awe-inspiring moment between Baby Groot and Ant-Man. The bright expression on the face is perfect. Plus, there’s something about the way this picture highlights the detail in the figure’s hand. Somehow, that’s what drew me in and sealed the deal on this one. Either way, this image wouldn’t be at all out of place in the trailer for a big Marvel Cinematic Universe release. Truly epic. This entry was posted in Toy Chest Theater and tagged action figure photography, action figures, Ant-Man, Ant-Man (2015 film), Baby Groot, Groot, Hot Toys, I Am Groot, Marvel, Marvel Cinematic Universe, Marvel Movies, MCU, Rob Siebert, Scott Lang, Toy Chest Theater, toy photography, toys on 11/20/2018 by primaryignition. With the passing of Stan Lee, fans from across the globe are paying tribute to the iconic creator in their own unique ways. I found this image from Nicholas Belmont to be particularly touching. 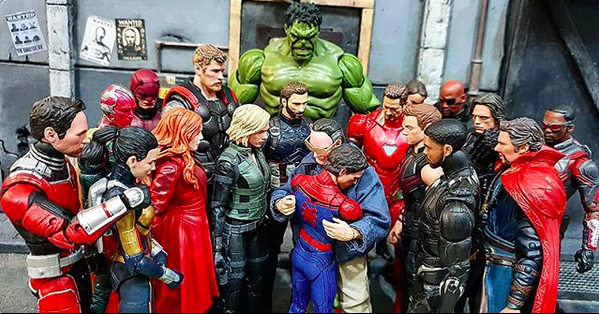 Since the news broke yesterday, I’ve seen a lot of “grieving” images from toy photographers. Many of which depict an emotional Spider-Man being comforted by other Marvel heroes. That’s perfectly natural, I think. There’s nothing wrong with that. People process grief in a lot of different ways. But for yours truly, in times like these scenes of love resonate so much more than scenes of grief or sadness. That’s what we get here. The love and respect we all feel for Stan Lee, personified by the characters he helped create. Rest in peace, Mr. Lee. Thank you for inspiring so many. This entry was posted in Comic Books/Graphic Novels, Toy Chest Theater and tagged action figure photography, action figures, Ant-Man, Black Panther, Black Widow, Captain America, Daredevil, Doctor Strange, Hawkeye, Hulk, Iron Man, Marvel, Marvel Cinematic Universe, Marvel Comics, Marvel heroes, Marvel superheroes, Marvel Universe, Nicholas Belmont, Nick Fury, RIP Stan Lee, Rob Siebert, Scarlet Witch, Spider-Man, Stan Lee, Stan Lee legacy, superheroes, The Vision, The Wasp, Thor, Toy Chest Theater, toy photography, toys, Winter Soldier on 11/13/2018 by primaryignition. This is the second time Jax Navarro has been in this space. In truth, he could be in this spot plenty more. There’s no shortage of quality shots over at Plastic Action. But this one? This one deserves to be framed on a damn wall. I’m not even kidding. I just love it. It’s so perfect. It’s a fantastic tribute to not only Back to the Future, but the now infamous Luke/Leia kiss from The Empire Strikes Back. We’ve even got hilarious contrast of Last Jedi Luke in Doc Brown’s costume! Follow Primary Ignition on Twitter, or email Rob at primaryignition@yahoo.com! 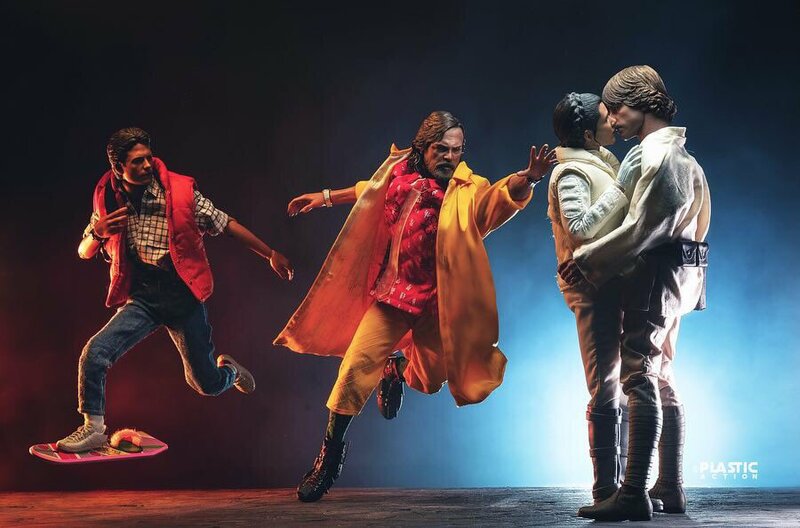 This entry was posted in Toy Chest Theater and tagged action figure photography, action figures, Back to the Future, Back to the Future Part II, DeLorean, DeLorean Time Machine, Doctor Emmett Brown, Jax Navarro, Luke Skywalker, Mark Hamill, Michael J. Fox, Plastic Action, Princess Leia, Rob Siebert, Star Wars toys, Star Wars: Episode V - The Empire Strikes Back, Star Wars: Episode VIII - The Last Jedi, Star Wars: The Last Jedi, The Last Jedi, Toy Chest Theater, toy photography, toys on 10/27/2018 by primaryignition. Up to this point, “Toy Chest Theater” has been mostly about creating scenes, as opposed to custom characters. But this take on Luke Skywalker from Scoundrels Stock changed that. This thing deserves to be in the spotlight. This figure is apparently inspired by the Star Wars expanded universe, i.e. the franchise’s seemingly endless litany of novels, comic books, video games, etc. Having consumed a lot of that stuff, I can definitely see it. This seems to be what Luke might look like 10 to 15 years after Return of the Jedi. I can respect keeping him mostly in black, too. As a more mature Jedi, it’s modest, yet imposing. One of the reasons this struck me so much is because I think this is the Luke Skywalker people wanted to see in The Last Jedi. The whole redemption story was interesting, partially because people didn’t expect that to be what happened to our great hero from the original trilogy. But this was the guy we were expecting. And perhaps in hindsight, should have gotten. Scoundrels Stock can be found on Instagram and Facebook. 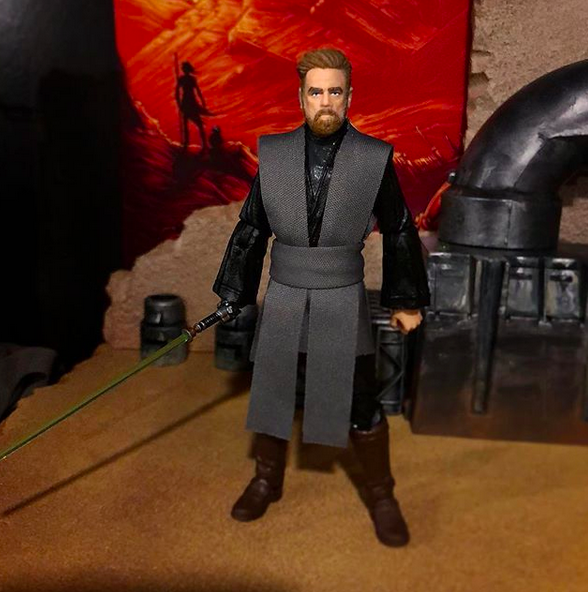 This entry was posted in Toy Chest Theater and tagged action figure photography, action figures, lightsaber, Luke Skywalker, Rob Siebert, Scoundrels Stock, Star Wars, Star Wars toys, Star Wars: Episode VI - Return of the Jedi, Star Wars: Episode VIII - The Last Jedi, Star Wars: The Last Jedi, The Last Jedi, Toy Chest Theater, toys on 10/19/2018 by primaryignition. Some of my favorite pieces are the ones you look at and say, “How’d they do that?” Is it a computer effect? Is it somehow practical? But the honest truth is, I don’t want to know. Why ruin the magic? And this photo by cgeRock definitely has that magic to it. Along with a few warm fuzzies. Uncle Tony gives Peter a helping hand. What’s not to love? The star of this photo is, oddly enough, the water itself. Not just the way it’s reacting to Iron Man, but the natural intrigue of what happens to that suit when it’s submerged. We’re inclined to think it’ll short out, or that it’s integrity will give due to the water pressure. But this is Tony Stark we’re talking about. And of course, it’s comic book science. Still, it’s not often toy photography tickles that part of your brain. cgeRock can be found on both Twitter and Instagram. 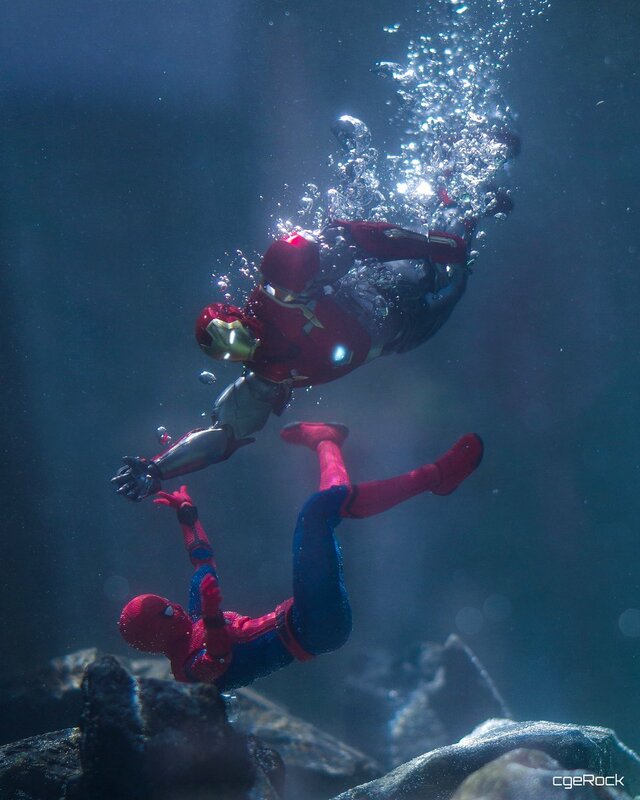 This entry was posted in Uncategorized and tagged action figure photography, action figures, cgeRock, comic book science, Iron Man, Iron Man Mark 47, Iron Man suit, Marvel, Marvel Cinematic Universe, MCU, Peter Parker, Rob Siebert, Spider-Man, Tony Stark, Toy Chest Theater, toy photography, toys on 09/28/2018 by primaryignition.